The African Grey Parrot (Psittacus erithacus) is the most favourite bird pet over the world. In Europe, USA, Asia, just everywhere thousands of these birds are traded every year. Many breeders are focused on breeding of this birds because demand on pet trade is high. That’s why poaching is not so intensive as it used to be in the past. However, it still exists. A new study of African Greys found out that the wild population in Ghana is almost extinct and its size was reduced by 90-99% in comparison with previous research in 1992. The team of authors lead by Nathaniel Annorbah from Manchester Metropolitan University (United Kingdom) warn that these parrots can disappear from Gambia very soon if government won’t start protecting this species. Twenty years ago a similar study was made and found out that within the net of 42 cells (each of 100 square kilometres) there were between 700 and 1200 African Grey parrots at each location. In the latest study, researchers found just 18 birds in total. The research team believes that 42% of birds are dying because of deforestation and 37% because of the pet trade. Unfortunately, we can observe similar trends in African Grey parrot populations in other countries of Western Africa. 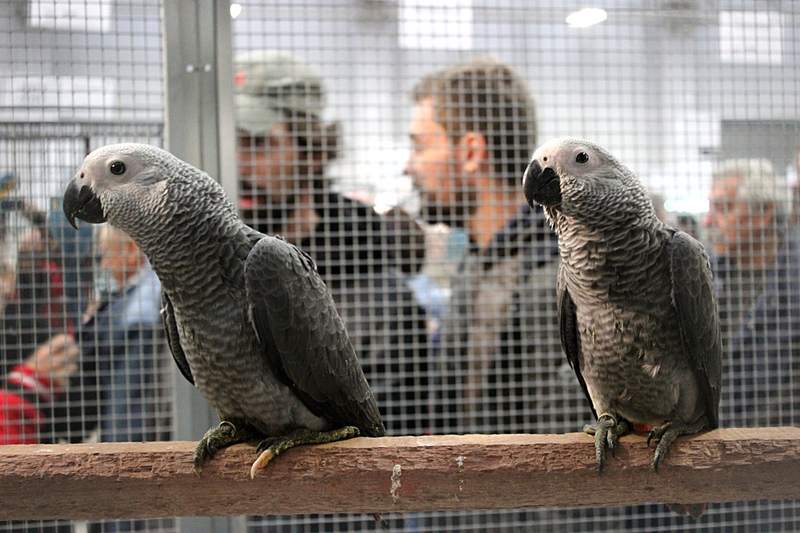 The situation is slightly better in Central Africa.However, even there pet trade is really intensive John Hart of the Lukuru Foundation in the Democratic Republic of the Congo indicates that 12 000 – 18 000 African Grey parrots are being exported out of the country every year although the annual export quota is only 5 000 individuals. Title photo: (c) L.Miguel Bugallo Sánchez. This file is licensed under the Creative Commons Attribution-Share Alike 3.0 Unported license. Hope the African grey parrot doesn’t go the way of the “Passenger Pigeon” of America that was hunted to extinction in the early 20th century by settlers in the New Continent. The African grey could be extinct due to the “PET TRADE” and deforestation in its native habitat of Africa.Captive breeding for the “PET TRADE” which is now practiced all over the World including my Country India is one way of reducing capture of birds from the wild forests. I learned recently that the passenger pigeon actually died out because hunting reduced the number of breeding pairs. So while yes, hunting did diminish the bird, it was secondary to the actual cause of extinction. Not enough selection for mates.